last year but, before reading this book, I couldn't remember anything that happened. In fact, I wasn't sure I was going to continue with the duology. When I was lucky enough to get an arc of this sequel, I figured I'd just give it a shot. It makes me sad to think I might not have continued with this series and missed out on a lot of enjoyment. I find myself remembering why I enjoy Ahdieh's writing so much. Her descriptions of the setting (a fantasy inspired by feudal Japan) are detailed and stunning. She really captures the place where the story is set. She's one of those authors who makes every scene feel a little bit magical, even when nothing supernatural is happening. , which is just fine by me. The relationship was left in a good place in the first book and I'm glad Ahdieh moved on to more important things instead of prolonging the angst. Here, Mariko finds herself in Heian Castle, playing the part of dutiful bride-to-be to the Emperor's younger brother, while the Emperor Roku himself becomes ever more violent and vindictive. The perspective of the novel frequently switches to secondary characters to offer more depth to them and more layers to the story. Indeed, the secondary characters were even more interesting to me than Mariko and Okami. From Kanako, the former Emperor's scheming consort, to Kenshin, Mariko's brother and dedicated samurai who never got over losing the girl he loved. Characters who at first appear to be villains turn out to be more complex, which I love. I love how this book shows a world where, on the surface, powerful men battle it out to be on top, but behind the scenes there are also powerful women pulling the strings. 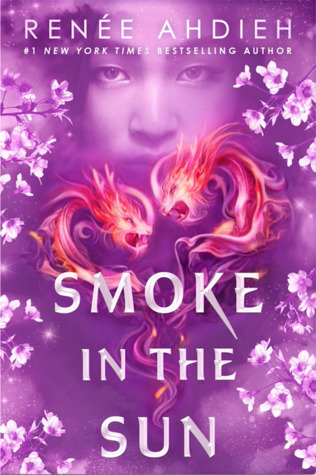 Mariko's friendships with Yumi and Suke offer a delightful break from the action and violence, and show that there is great power in one woman helping another.
. Ahdieh's future in YA looks set to follow writers like Bardugo and Maas: a balance of magic, drama, action and romance that is a guaranteed bestseller. No, but really, since when is it okay for a series with such unique content and loveable characters to end so soon? withdrawal. Just when you start caring for the protagonists so much… they are stolen away from you. Hatred for duologies aside, I have to admit I admire Renée Ahdieh for knowing when to stop. It’s better she stops then goes on to develop her series some more, only to go in the wrong direction and ruin everything, like previous authors have done. should have been a duology after all. mesmerized me, but boy did I have to push through at times. The story is incredibly interesting nonetheless, but even my imaginary turtle moves faster than that. It’s like the author heard my prayers because I was able to finish this in two sittings and didn’t have to force myself one second. I’ll come clean and say that I forgot who most of the characters were, so I even had to Google them at some point. Renée does introduce them again in the beginning, but my brain couldn’t process. Fortunately, the more I read, the more my memory resurfaced, and so did my love for Mariko. Strong female characters are more present than ever in YA fantasy books, but not all understand their worth like Mariko does. She knows she deserves to be free and loving a man does not mean giving everything up for him in the process. Without necessarily realizing it, she is fighting for equal rights. renee ahdieh is the queen of duologies. she has mastered the art of giving just enough of the story to satisfy the reader - not too much, and not too little; just the right amount. it felt like this was the yin to the ‘flame in the mist’ yang. where the first book was very fast paced and daring, this was more calm and calculating. so neat how one whole story can come together with two completely different halves. and whilst i am more than satisfied with the conclusion of this story, i cant help but feeling i preferred the first book. i think thats because the main characters spent a great majority of the book separated, and i feel like they grabbed my attention more when they were together. i also preferred the feel and style of the first book - this was a tad bit slow for my liking. but overall, another fantastic series by a wonderful author. cant wait to see what she comes up with next!! It wasn’t bad, but it wasn’t the best it could’ve been for me. I felt like it almost lulled into a false sense of security, because the beginning was that good. Firstly, this book had quite a few typos. Editors, what the hell?! Secondly, it started off great. I was so excited to be back in this world again as I loved Flame in the Mist. At the beginning of the story, we were re-introduced to the characters again (and others), their struggles, and their inner turmoils was spoken about in great detail. Events that took place in the last book were now affecting the kingdom and its people and we were seeing how that was impacting certain individuals, which I really, really enjoyed reading, but the society as a whole wasn't looked at in as much detail. The development of each of those characters and Ahdieh really diving into the dynamics of each of them was awesome to read. Their voices were distinct, the writing gorgeously rich. It truly carries you away into the world and into the minds of the characters. This carried on up to the half-way point alongside the court intrigue and then that’s when things slowly started to fall apart. What I had a issue with was the plot. As well as the ending, but the politics of the world was slightly flimsy and not concrete. The tyrant that took over after his father acted like an annoying child not getting his way. It would’ve been nice to get his perspective and delve into his mindset and cruelty (it was there, despite the child comment) but we weren’t given any. His character arc would’ve been so intriguing. Or we should have had a better introduction in Book 1, as the sibling rivalry aspect played such an important role, as well as Kanako and her powers, which I loved but needed more off. The ending was annoyingly rushed. It’s frustrating, because there was so much build-up at the beginning, which was incredible and so well done. Then everything about the characters, their development, and the plot was crammed in and finalised. It felt unfulfilling. I really do like this duology enough. The emphasis on Mariko fighting for her beliefs, establishing her own identity was really honed in. Feminism 101. If only there was more substance to it all. To be honest, I still can't believe that I have finished reading this book because I remember reading the first book months ago and I loved it and after I finished reading the first book, I felt like there was something missing inside of me and the sequel would fill this missing piece in me. So I was really excited and happy when this book arrived at my house and it was like a pure happiness for me. It was like the best day ever in the week ( it probably was ). But sadly, I didn't love it as much as I thought I would. Well, I still liked the book but I didn't love it. It wasn't amazing but it was a pretty good read for me. and now about the plot, well the plot was good enough but oh my God, there were some brutal scenes and it was brutal enough to make me uncomfortable, grimaced, averted my eyes and I kept wanting to skim reading when I read those brutal scenes but I didn't do that because I was afraid I would miss something important and I still remember those scenes in my mind and I want to forget them so badly. I just don't want to remember them. Those make me afraid and uncomfortable. and it honestly brought tears to my eyes because that was exactly what I wanted to read and this is also what I want in real life. While I was reading this book, I kept wishing and hoping that one day I hopefully would get a man like him. The romantic relationship between Mariko and the love interest was just so beautiful. Mariko was determined, fierce and strong. She's honestly like an inspiration for me and I felt as if there was this connection between me and her. I was just so proud of Mariko and I always agreed with her and nodding along with all of her decisions. She's certainly one of my favorite characters that has inspired me. In this book we also get know more about Yumi and I liked Yumi but not as much as I liked Mariko. I don't know what else to say. I'm speechless.